Seventeen years ago, Australia's cricketers arrived in Port Elizabeth flushed with confidence after routing South Africa by an innings and 196 runs in Johannesburg. Their brio was summed up by Steve Waugh, who publicly doubted the hosts' capacity to rebound from a hiding of such magnitude as they faced their first series defeat at home since returning to international cricket in 1992. What awaited the cocksure tourists at St George's Park was a pitch made to the specifications of the hosts' coach Bob Woolmer and captain Hansie Cronje, an extremely well grassed and untrustworthy strip that ensured there would be a result, in conditions where Mark Taylor's team had struggled in preceding years. After two days South Africa had run up a lead of 184 with all 10 second innings wickets in hand. The events of the next two days might be summed up as "the legend of Port Elizabeth". Australia's bowlers surged on the third morning to take those 10 wickets for the addition of only 81 more runs. 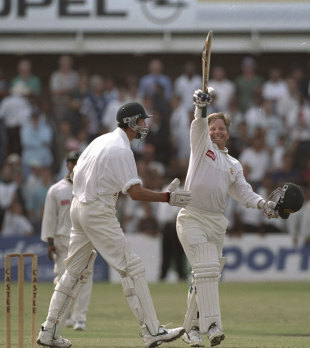 The chase, which like poor pitches was seen as the team's weak spot, was marshalled wonderfully by Mark Waugh's hundred. When a late rush of wickets threatened the result, Ian Healy struck what he estimated to be the first six of his first-class career to seal victory. Taylor, in the midst of an 18-month run drought, called it the best win of his life. Asked about that shot and the result it wrought, Michael Clarke gave a quizzical look. "How did I miss that?" he said. "Heals hit a six?" The team were later told a little about the match by the squad doctor Peter Brukner ahead of their regular quiz night. However distant the memory, that meeting takes on some relevance for this one, as circumstances of series and pitch have converged in a remarkably similar manner. Once more Australia arrive with all the confidence gained by a storming display on the Highveld, and once more South Africa are scheming a way to protect a proud unbeaten record via consultative pitch preparation at sea level. Then, as now, Australian eyebrows are being raised by the unabashed discussions between the St George's Park curator Adrian Carter and the coach Russell Domingo, who had established a relationship over years together with Eastern Province. As with tours of India and England last year, Clarke's team are at the mercy of conditions tuned to suit their opposition. It is a trend only Australia has avoided in recent times, even if Clarke admitted to occasionally wishing he could twist a groundsman's arm now and then. "[It's everywhere] apart from one country I know quite well," Clarke noted wryly of pitch doctoring. "It doesn't bother me. That's a big part of playing international cricket, you travel the world and play in different conditions. I think it's a big part our game that the captain, especially, can communicate with the groundsman in his home country and produce the wicket that is best suited to their team. "I would like to see it happen more that way in Australia but in saying that I think the wickets in Australia, we're very lucky compared to a lot of other countries around the world. We get very good Test cricket wickets, there's normally enough in there for quicks and spin bowling but generally if you get in it's a beautiful place to bat. So it's not like I don't communicate, I speak very openly and honestly with our groundsmen but I'm confident that they'll produce a great cricket wicket anyway." The major difference between now and 1997 is that Australia quite liked the idea of a grassy surface. Taylor's team built their success on the ability of a strong batting line-up to make runs and then waiting alertly in the slips for Shane Warne and Glenn McGrath to apply the 'coup de grace' on good pitches that wore over five days. They were notably less comfortable on sportier pitches, encouraging the grass at St George's Park. However Johnson's terrifying speed and the ability of Ryan Harris and Peter Siddle to stand up the seam make them a highly threatening trio in just such a situation. South Africa need runs from batsmen of shaken countenance after Centurion which would offer the chance to put Australia's talented but less than consistent batting order under some scoreboard pressure. The only possible change to the team - unlikely as it may seem - would be to include James Pattinson at the expense of Nathan Lyon, who has struggled somewhat with a stomach ailment despite bowling well at Centurion. Pattinson's inclusion would add still further to the pace battery and also add a little more starch to the lower order batting. Either way, Shane Watson is not expected to return. Clarke then was eager to see the grass remain, but at 12.15pm on match eve Carter could be seen applying a partial shave with his mower. Of course he will not be able to apply the same treatment to Johnson's moustache, and the tourists will be confident of achieving a similar result on a less responsive pitch than at Centurion, just as their forebears fought their way through the thicket of 1997 to secure a series win. A large part of that belief is derived from the way Johnson dominated England on Adelaide Oval's drop-in after the hosts had run up a tally of 570 for 9 declared. His 7 for 40 on days two and three demonstrated that the character of the pitch was not the decisive factor in his new-found effectiveness, despite what Graeme Smith had to say following the Centurion hiding. Adelaide helps Australia in another way, providing a reminder of how a major victory like Brisbane or Centurion should be followed up. While the tourists celebrated their opening win heartily in each case, the team's focus has not been diverted by the vast margin of victory. Clarke offered plenty of perspective on this, noting that a meteoric rise over the past six Tests cannot obscure the days, months and years of indifferent displays that preceded it. "We're playing some good cricket but we know we've got a lot of improvement in us, we know we're playing the No. 1 team in the world so we have to be at our best to give ourselves a chance of beating these guys," Clarke said. "There's no complacency in our group and there hasn't been through the Australian summer - we have no reason to be complacent. "We're ranked third in the world and we went a long period without winning a Test. At the moment we've got a bit of momentum, we're trying to run with that for as long as possible, but we understand the fact that we're playing such a strong team. If we're five per cent off they'll destroy us." Australia's win in 1997 was a key moment in the building of an era, for it proved beyond doubt that they could win Test matches from anywhere, under all conditions and in all territories. Another victory in Port Elizabeth 17 years later would add considerably to the aforementioned legend, lifting Clarke's team to the ranks of legitimate contenders through the winning of a major overseas series.